Astronaut Scott Parazynski, after arriving at Mount Everest. Searching for signs of life on Mount Everest could provide awindow into the extreme environments that organisms might inhabit elsewhere inthe universe. So, former astronaut Scott Parazynski will set upinstruments to hunt down elusive evidence of life at the top of the world whenhe attemptsto summit Everest Wednesday. Parazynski, a veteranof five space shuttle flights, has also been a life-long climber. 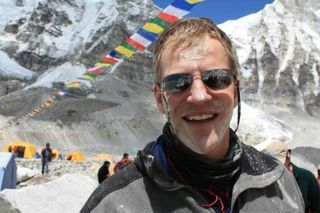 Parazynski left NASA in March, just before departing toEverest. "I've been dreaming of an ascent of MountEverest ever since I began dreaming about space as well," Parazynskitold SPACE.com. In fact, the two dreams hold a similar appeal. "Whenyou stand in a place that very few others can go, it's really a neat accomplishment,"he said. He and his climbing team first planned to try to reach the summit earlierthis month, but weather postponed their attempt. During this trip, Parazynski is combining his two passionsof space and climbing by conducting astrobiology research. "We're looking for evidence for life in theextreme," he said. "Things that can live in theharshest environments on Earth may be the kinds of things that once existedon Mars or other planets." Living organisms have been found in some of the most tryingenvironments on Earth, such as highly acidic lakes, deep mines and dark, coldunderwater depths. So there's a chance that life also exists on the frigid,oxygen-deprived peaks of the Himalayas. In collaboration with scientists at NASA's Ames ResearchCenter in California, Parazynski has planned a series of experiments to conducton the mountain to hunt for signs of extreme life, called extremophiles. Forinstance, he hopes to find lichen, algae and bacteria on the rocks at the tallestmountain in the world. Parazynski also brought along devices to measure the surfacetemperature of rocks, as well as their exposure to ultraviolet radiation, whichmay be so high at such a lofty altitude that many life forms would be unable tosurvive. He plans to deploy DNA samples at various sites and then retrieve themto determine in the lab how much ultraviolet radiation they were exposed to. "Ultraviolet radiation is a key parameter in thesustenance of life," Parazynski said. "But too much, of course, andeverybody gets skin cancer and it affects plankton blooms. We'll be up at thosealtitudes at the peak of UV penetration, and we'll be able to assess the amountof ultraviolet damage taking place." He'll also leave sensors on rocks to detect whether anyliquid water exists at any time during the day, or if ice and snow simplysublimate to vapor without passing through the liquid phase. "If water does exist in certain areas, then life canform there," Parazynski said. The astronaut may even leave some sensors and equipmentbehind when he descends, to let the instruments collect data and transmit itback to scientists throughout the year. Though scientists have previously conducted some geologyand ecology research at Mount Everest, Parazynski's work may be the firstattempt to do astrobiology there. If he gets really lucky, he may even findsome fossilized remains of life on the crag to bring down for his research teamto analyze. Parazynski almost became the firstastronaut to summitEverest one year ago this month when he ruptured a disc in his back. Hedecided not to push through the pain and returned to base camp. Since then, hehas had back surgery.